I love the buzz of a big crowd. It’s exciting to soak up the atmosphere created when lots of people are all in the same space at the same time. If you’re lucky enough to be the band, or sports team or speaker who is the focus of the crowds attention, then that is quite powerful. If you design or develop software it’s much harder to get feedback like this. But, it’s still useful to think of crowds to help you visualise the audience of people who are using what you’re building. This was the idea behind the photo I use in the header this site. These come from a 2006 article about Trade Me in Idealog, and were taken at the Westpac Stadium in Wellington on a wet and wild day (hence the slightly damp windswept look and the Icebreaker jacket). The stadium seats about 35,000 people when it’s full. At the time there were about that many people online at once every evening on Trade Me. When you think of that many people all in one space together, and the noise and activity they generate, it changes the way you think about the people using your site. One of the things that software developers do all the time is dismiss a percentage of their audience as unimportant for one reason or another, without thinking of them as a distinct group of people. If you don’t think you need to worry about people stuck using IE6 (for whatever reason) or a dial-up connection, or people who struggle to read small fonts, or people who are colour blind (or completely blind), or people who don’t know how to use a command line, or people who are still nervous (paranoid or otherwise) about entering their credit card details into a website, or people who want help from a real person, or people who use Firefox on a Mac … because on a percentage basis they are not that many … calculate just how big that group is (take your unique visitor count and multiply by the percentage, however small), and then imagine standing up in front of that group and telling them to their face that they don’t matter to you. If you don’t think it’s a big deal for your site to be broken or off line while you make changes … think of all of the people who happen to be visiting at that point and imagine what it would feel like to have them all in the room with you while you flick the switch. No matter how small the number it would probably feel like a lot of people. And, you might be motivated to get the site back up more quickly if they were all standing behind you impatiently looking over your shoulder. You can use the same technique to help put other numbers in perspective. It’s amazing the difference it makes when you start thinking of your metrics as real people. 2 people = your mum and dad! The key to happiness is apparently simple: low expectations and unsuccessful friends. Posted on August 3, 2008 August 3, 2008 Author Rowan SimpsonCategories New Zealand, Trade Me1 Comment on How’s the weather? How many steps does it take to get a change live on your website? Ideally it should be a one click process. Otherwise, when the pressure is on (i.e. when there is a bug on the site that you quickly need to fix) you’re sure to forget some critical step and make an even bigger hole for yourself. What we called “the deployment process” changed a lot during my time at Trade Me. In the very early days we just copied ASP scripts directly onto the production server. We only got away with this because there were not many people writing code and there were not many people using the site. Later, as we moved to having multiple web servers which each required a copy of the code, we created a simple Windows application which copied the files from our local directory onto each of the web servers and would also execute selected SQL scripts against the production database. This was much better, but still relied on the developer doing the push to have the correct files on their local machine. As the site got bigger there were some new complications. For a start there were more people involved. The teams responsible for testing and for maintaining the database and servers got increasingly nervous about developers having the ability to push code at any time. The code base got bigger, making it more difficult to keep in sync. The number of people using the site increased massively, making it less and less practical to just put code changes multiple times during the day. And, we also moved to using ASP.NET, which added the complication of having a build step in the process. To address some of these issues we developed a new tool we called the “Release Manager” which hooked into source control and allowed us to package up changes so that they could be pushed to test or to production with one click (using simple NAnt scripts under the covers). This removed a lot of the complexity and stress from the process. I’m sure it has continued to evolve since I left – if anybody from Trade Me is reading it would be interesting to hear about how you do it now. Towards the end of my time there the test team, who had final sign-off on each release (twice per day at that point), got into the habit of queuing up ‘Push The Button’ by the Sugarbabes on the MP3 player when they were ready for changes to be deployed to production. Every time I hear that song now my pulse increases slightly at the prospect of some site changes going live! How do you manage deployment? There have been some interesting changes on Trade Me over the last week. 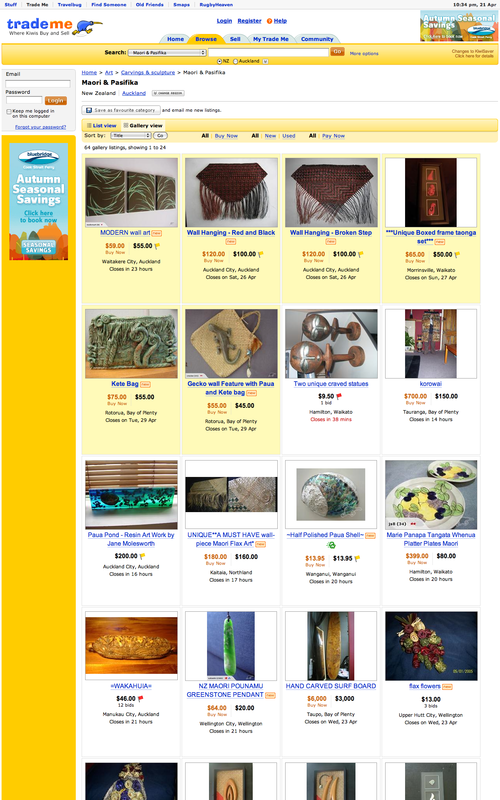 The “cards” used to display lists of items for sale have had a design upgrade, with bigger fonts and bigger photos. These two simple things have resulted in good improvements in the past, so the team at Trade Me will be hopeful that the same will be true this time. I think they are a nice evolution and look great! 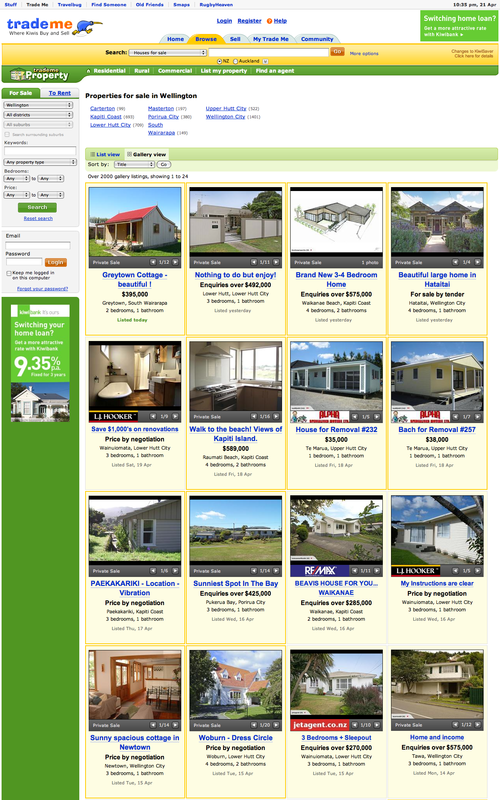 I especially like the new photo viewer in Trade Me Property, which means you can now view all of the photos for a listing without having to first click into the listing itself. This makes it much quicker to browse. But, as always opinion is divided on the message boards. Trade Me will be amused by the comments, but mostly interested in the numbers. They will probably already know if these changes have had a positive or negative impact on page views, bids and length of time spent on the site. In the past all three of these metrics have been improved just by increasing thumb nail image sizes. In time they will be able to tell if it has resulted in more sales. If you’re keen you can follow this yourself using the published sell-thru rates (the percentage of items listed that actually sell). Meanwhile, the message boarders have moved on to complaining about postage prices. Disclaimer: I no longer work at Trade Me or have a financial interest – I’m just an interested observer like the rest of you.